I had the pleasure of sitting with Liz from Hoosier Homemade at dinner when I was in Nashville! She’s the real-deal! And she’s got a fabulous dinner to share with us tonight…complete with dessert too! Cooking a special dinner for my family, including 3 teenage boys, is one of the things I love to do. Trying to keep our grocery budget down, can sometimes be a struggle, especially when I want to create a meal with a main course, side dish, dessert and a special drink. This Mexican Fiesta fits our budget perfectly. 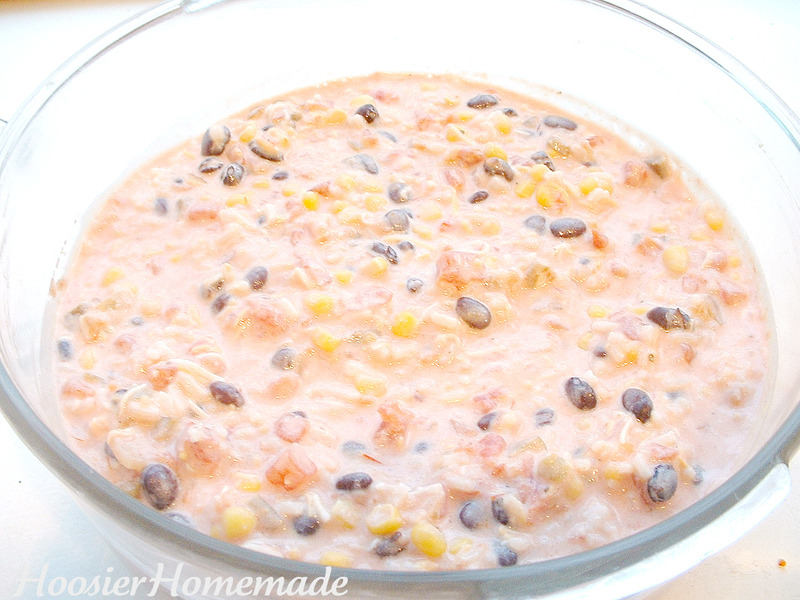 In a large bowl, combine all ingredients, except onions, olives and Mexican cheese. Transfer to baking dish, sprinkle with onions and olives. Bake, uncovered at 350 degrees for 30 minutes. Sprinkle with Mexican cheese, bake 5-10 minutes or until cheese is melted. Let stand 5-10 minutes before serving. Note: This dish would also make a great dip and you could make some Homemade Tortilla Chips to go with it, for a yummy treat. 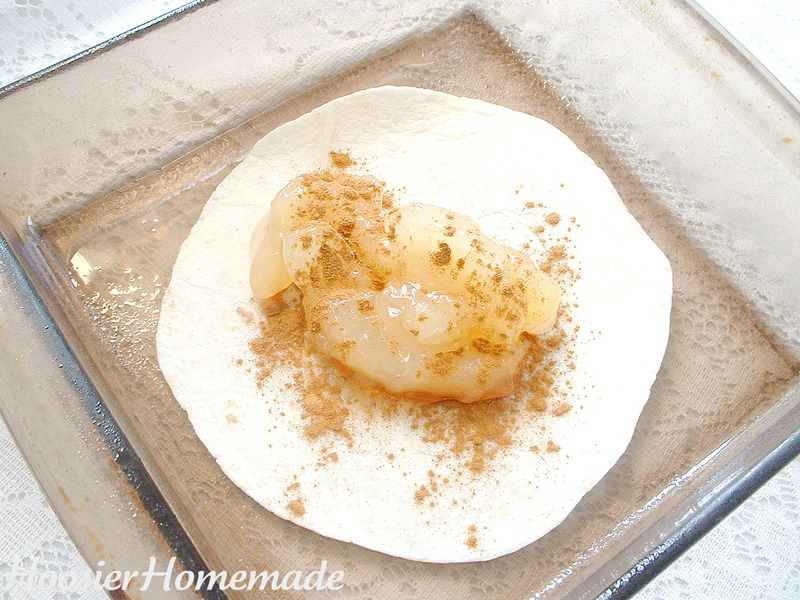 Sprinkle a little cinnamon onto tortilla and then spoon fruit evenly, sprinkle with more cinnamon, roll up tortilla and place seam side down in baking dish. Combine margarine and sugars in a saucepan and bring to boil on stovetop, reduce heat and simmer for 3 mintues. Pour over tortillas, sprinkle with more cinnamon. Serve whole or cut in half for 12 servings, add some Ice Cream and a sprinkle of cinnamon sugar for a yummy presentation. Total cost $1.78 including ice cream. Note: This dessert was really good, it would also be good with raisins added to the apples or even cherry pie filling. We all enjoyed this Mexican Fiesta, it will definately make it onto my monthly menu plan in the coming months. Total cost for our special dinner $4.63 and we had some leftovers. Liz is a SAHM of 3 teenage boys and happily married for 20+ years. She shares lots of homemaking tips including her love for baking, cooking and decorating. She hosts the Cupcake Tuesday blog carnival with lots of cupcake creations. Thank you so much for the opportunity to guest post! I’m thrilled! This looks Good!! Love the snowman plate/bowl too! Mmmh, this looks like a lovely cosy meal – and such an easy dessert to knock up too! 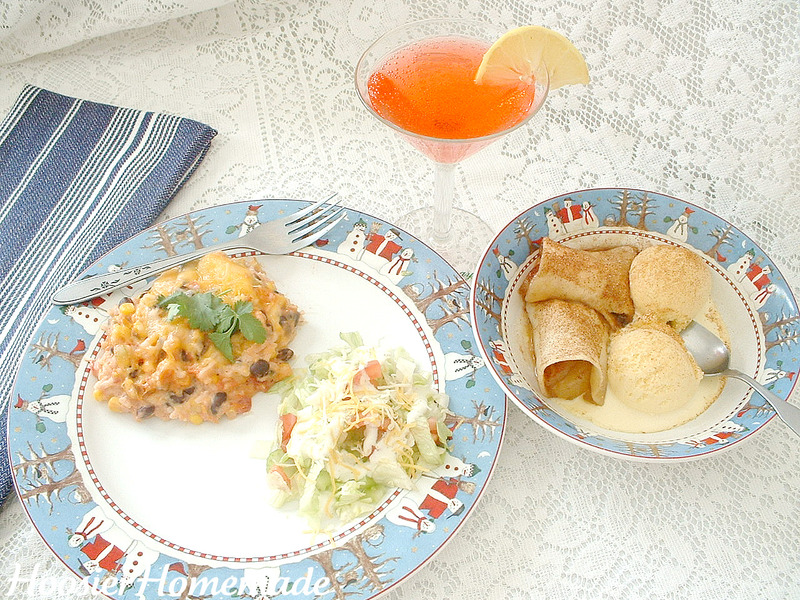 Oh, I am loving the apple enchilada idea! 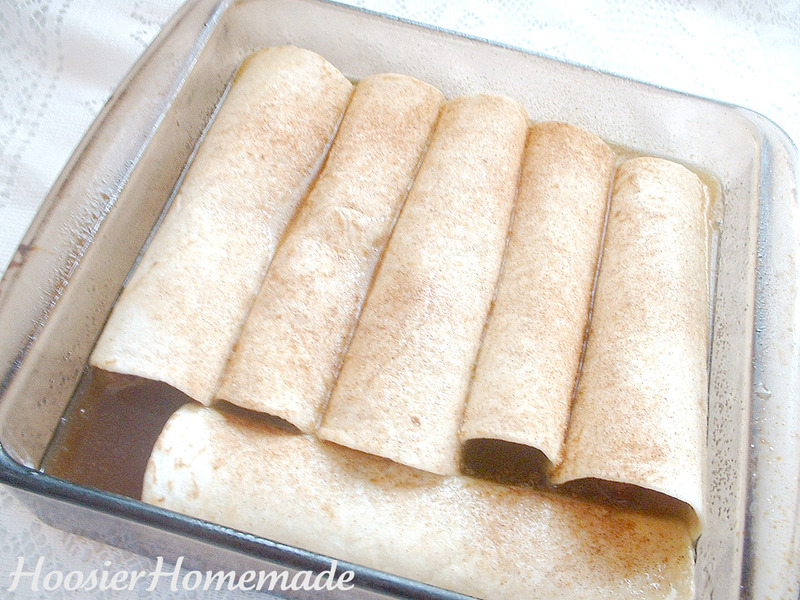 We make Mexican frequently in our house, but I had never heard of apple enchiladas. Yummy! Hmmm..is there a way to print a post other than copy & paste? I’ll add the print link…sorry! Where does the water get used in the Apple Enchilada Dessert? In with the margarine…Liz clarified! I’m so sorry, I neglected to add the water to the saucepan with the margarine & sugars. Hi ladies. Going to make this tonight. I actually just finished making my own apple pie filling because I couldnt find any organic or low sugar variety at my grocery store when I went looking but they did have bags on apples for very cheap. So, since i made my own filling and it is very juicy do you think I should still pour the sauce down over the top when i finish making this tonight? I did mix in some cornstarch to my batch of apples. @kelly overend, This apple dessert is so good, i’ve started eating it for breakfast. the first time i used apple sauce, the 2nd i baked up my own apple. it is so good i can’t get enough of it, tastes better than apple turnover! so glad you shared your recipe with us! 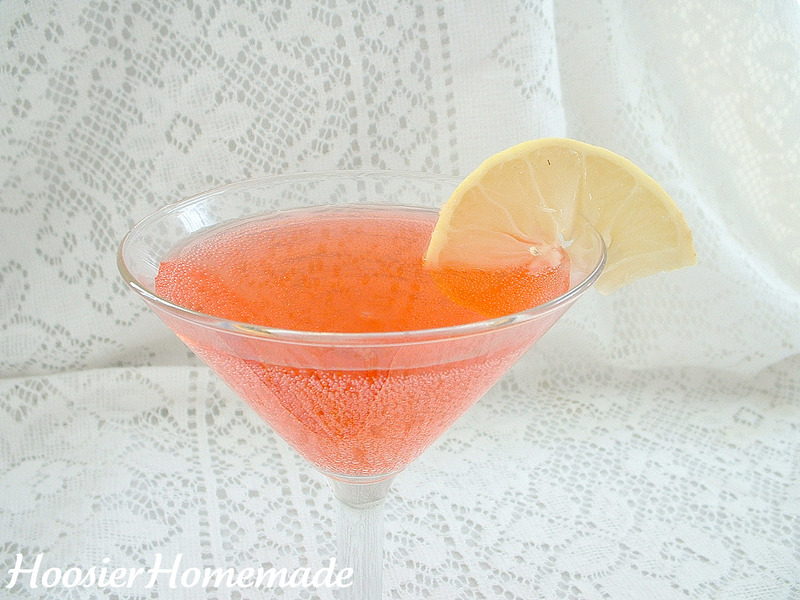 We made this a few weeks ago & it was an instant hit!!! I made it for dinner & my husband had accepted a dinner invite from some friends. While waiting for them to pick us up to go to the restaurant we couldn’t stop eating it from the pan! We even tried to throw our forks in the sink to be “done”…nope we just got another one out of the drawer! It is sooooooooo good! Even our 4 year old who can sometimes be a picky eater loved it!! I’m making it tonight for the same friends who we went out with that night…this time I’m adding chicken! !